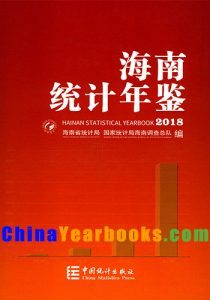 Ⅰ.Hainan Statistical Yearbook 2018 is an annual statistical publication which covers statistical data for the economic and social development of 19 cities,counties and Yangpu Economic Development Zone in year 2017,as well as major statistical data in important historical years. 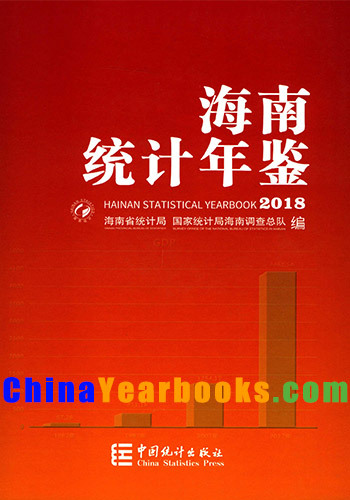 Ⅱ.The Yearbook contains twenty-five chapters:1.General Survey;2.Population;3.National Accounts;4.Employment and Wages;5.Prices;6.People’s Living Conditions;7.Government Finance;8.Resources and Environment;9.Energy;10.Investment in Fixed Assets;11.Foreign Trade and Economic Cooperation;12.Agriculture;13.Industry;14.Construction;15.Real Estate;16.Wholesale and Retail Trades,Hotels and Catering Services;17.Tourism;18.Transport,Postal and Telecommunication Services;19.Financial Intermediation;20.Science and Technology;21.Education;22.Public Health and Social Services;23.Culture and Sports;24.Public Management,Social Security and Social Organizations;25.Urban and,Rural.Each chapter begins with Brief Introduce to the main content,data sources,statistical method of this chapter,etc.Explanatory Notes on Main Statistical Indicators are provided at the end of each chapter to briefly describe the content of main statistical indicators,statistical scope and so on. Ⅲ.The statistical approach and scope in this yearbook base on the current national statistical report system basically.Data are mainly obtained from annual statistical reports and sample surveys of government statistical departments,some from annual statistical reports of government or administrative departments. Ⅳ.The units of measurement used in this yearbook are internationally standard measurement units.Newly published and implemented Product Categories are uniformly used. Ⅴ.Statistical discrepancies on totals and relative figures due to rounding are not adjusted in the Yearbook. Ⅵ.Notations used in the Yearbook:(blank space) indicates that the figure is not large enough to be measured with the smallest unit in the table,or data unknown or not available;“#”indicates a major breakdown of the total.